An imagined relationship between a great Russian writer and the inspiration for one of his characters. Mikhail Bulgakov’s The Master and Margarita famously imagines a visit to Moscow by Satan. Written during Stalin’s reign, the novel wasn’t published until 1966, a quarter century after its author’s death. 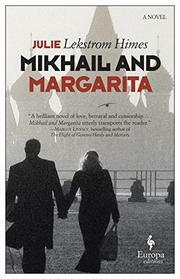 In her debut novel, Himes attempts to resurrect the brilliant Bulgakov and to give shape to his fictional Margarita. In Himes’ imagining, Margarita is mistress to Osip Mandelstam, another real-life Russian luminary, until Mandelstam is arrested, tortured, and banished to the hinterlands. Then she takes up with Bulgakov. They’re more or less happy together until they start noticing a mysterious figure who seems to pop up at auspicious moments. Ilya is an intelligence agent, and he’s out for Bulgakov, right up until he falls in love with Margarita himself. Then things get blurry. There’s an arrest, exile to the barren steppe, a labor camp, an escape attempt—but Himes’ plot never really comes together. The narrative shifts from Bulgakov’s to Margarita’s point of view, but neither perspective is convincing, and the characters aren’t exactly lifelike. Himes’ choice to invent a fictional mistress for a real writer is an odd one. Actually, Bulgakov apparently based his Margarita on a woman named Yelena Shilovskaya, whom he married; but there doesn’t seem to be a connection between Shilovskaya and Himes’ Margarita. Himes might have been better off inventing all her own characters. Bulgakov’s presence in her narrative serves as an unfortunate, and unwelcome, reminder of the discrepancy in talent. While Bulgakov was a vicious satirist, wickedly funny, Himes’ tribute is startlingly humorless. Despite vivid prose, Himes’ debut seems to wander aimlessly, unconvincing and bleak.